Where Her Book Ended, His Story Began. I spy Mickey Mouse! And is that Mary Poppins, too? Indeed it is. Direct from the UK, the first teaser poster for Disney's Saving Mr. Banks has been debuted, and it shows both Tom Hanks as Walt Disney and Emma Thompson as author P.L. Travers. The first full trailer was revealed earlier this month, and Disney is firing up their marketing with a D23 Expo appearance as well. Other than Mickey and Mary in their shadows, there's not much else to this poster save for the off-white coloring, but sometimes simplicity works well. If you're a big Disney fan, this is worth seeing. Take a look! 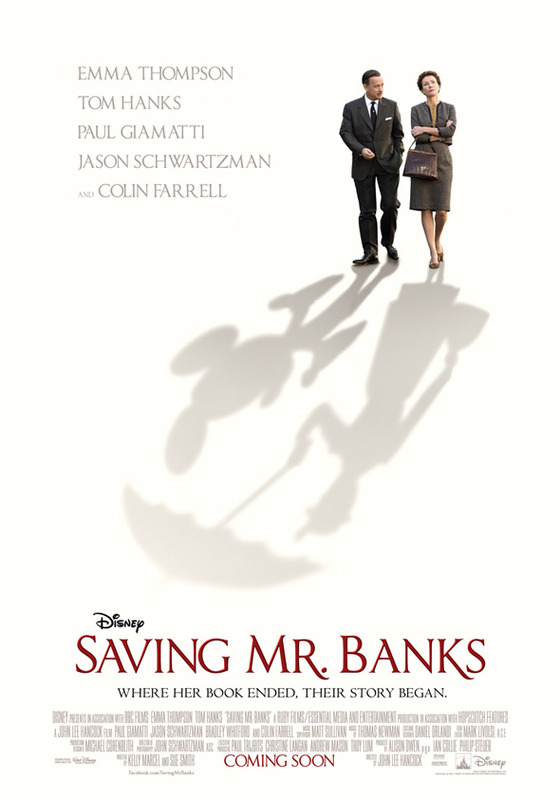 Inspired by true events, Saving Mr. Banks is the extraordinary, untold story of how Disney’s musical classic Mary Poppins made it to the big screen and the testy relationship that the legendary Walt Disney (Tom Hanks) had with author P.L. Travers (Emma Thompson) that almost derailed the production from ever happening. John Lee Hancock (The Blind Side) directs the film written by "Terra Nova" writer Kelly Marcel, making her feature writing debut. Colin Farrell, Paul Giamatti and Jason Schwartzman also star in the film which gets a limited release on December 13th and hits theaters everywhere December 20th. The film will be released in UK in Winter 2013. If you haven't seen the first official trailer yet, be sure to catch it here. So excited! I'm gonna watch my dvd of Mary Poppins again before I go see 'Mr Banks'! This could do with title change. They're taking the concept of branding to a whole new level! I read once that Travers ultimately despised Disney. I wonder if that will be portrayed light heartedly or aggressively. It's Disney's production so I think it would be safe to assume to former. Great Emma Thompson. I hope in nomination Oscar.